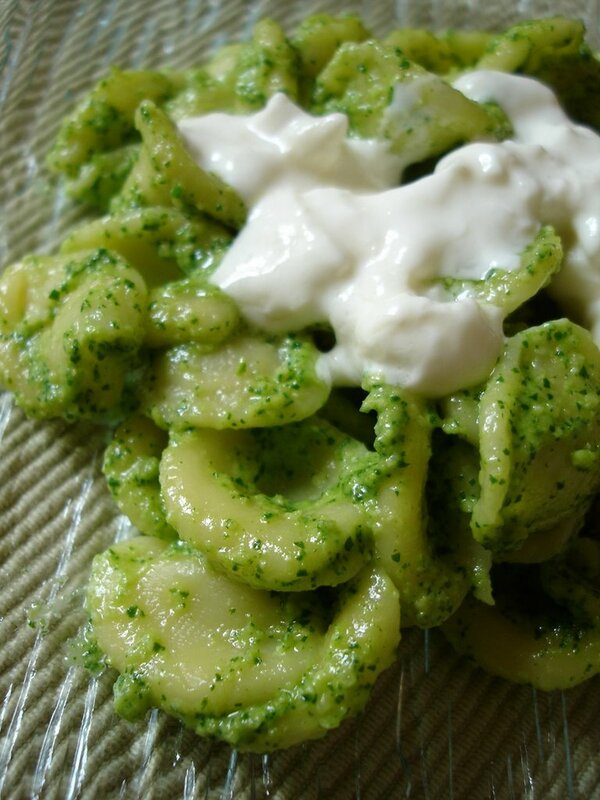 So, that is, in approximate English, fresh pasta with rocket pesto and fresh cheese. I realize this is maybe a difficult dish to assemble outside Italian borders, but with some adjustment, everybody can do it. Pesto is a typical pasta sauce from Liguria, made with basil, garlic, pine nuts and extra virgin olive oil, all blended together in a marble mortar. In this recipe I used rocket salad instead of basil, almonds instead of pine nuts, and a blender instead of the marble mortar: quicker, easier, and better for spring, as good basil doesn’t come before summer. I suppose it is possible to find rocket salad about everywhere in the world, but I think the problem for someone living outside Italy is to find burrata. Burrata is one of the most wonderful thing we, Italians, do with milk. It’s something between mozzarella and cream, it is made with an outer shell of mozzarella, filled with mozzarella bits mixed with cream, closed with a string and enveloped in fresh leaves. It is a product that comes from Puglia, the Italian region that makes the heel of our peninsula, and specifically from Andria and its terroir. In Milan I can find good burrata only during winter months, as it must travel all through Italy to get here, and when it is cold there is no possibility to ruin the product during transport or downloading it. Of course you can substitute burrata with good mozzarella, or, for the matters of this recipe, even with ricotta. Orecchiette too are the typical fresh pasta from Puglia, but I suppose are quite easily found in any good Italian grocery shop. As you see from the recipe below, it is one of the easiest and quickest dishes to prepare. While the water for the pasta is on high fire, make the pesto. Put in a blender glass the rocket salad, almonds and garlic. Begin to blend, and add little by little enough olive oil to have a thick cream. Add some salt if needed. Set aside. Cook orecchiette in boiling salted water for the time given on the package. Drain it thoroughly, mix it with pesto and sprinkle with diced burrata. Il frigorifero offriva ciò, e io, fedele credente della religione del buono e veloce, mi sono piegata ai voleri dell’elettrodomestico indispensabile e ho cucinato ciò che lui mi metteva a disposizione! Mentre l’acqua per la pasta bolle, preparare il pesto. Mettere la rucola, le mandorle e l’aglio nel frullatore. Azionare e aggiungere a filo l’olio, quanto basta per fare un pesto cremoso, ma non troppo. Cuocere le orecchiette, scolarle, condirle con il pesto e con la burrata grossolanamente spezzettata. la burrata! la burrata! giusto! deve essere squisito così! E molto bella! This is such a simple, beautiful pasta dish that to me typifies good Italian food. It truly looks wonderful! I live in LA, and have been told that burrata can be found here- this recipe is even more incentive to track it down! sembra veramente ottima questa ricetta! Sounds so wonderful. I am simply nuts about arugula, but I haven’t made pesto with it. Great idea.